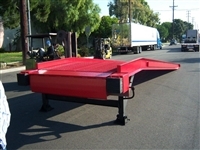 The Medlin mobile yard ramp is the state of the art way to load and unload containers. If your company doesn’t have a loading dock, a yard ramp is the perfect solution. Made from heavy duty carbon steel which ensures years of reliable service. All Medlin mobile yard ramps come standard with all weather serrated grating and a 6′ level off. The 2 speed manual crank system and 4 iron core poly wheels make adjusting and moving the ramp a breeze. The 2 speed manual crank system also eliminates the worry of hydraulic failure that other brands use. Each ramp also comes standard with safety chains and a tow boot for easy one man operation. We offer capacities from 16k to 40k. Custom sizes are also available upon request. All ramps come standard in safety red.